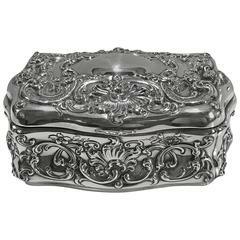 Large Sterling Silver Jewelry Box by Charles S Green & Co.
A very elegant large jewelry box, perfect for both a lady or gentleman to keep anything from Diamonds to cufflinks. 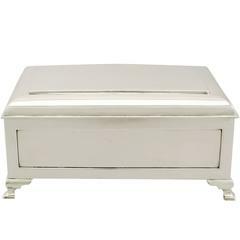 The demilune form stands on form elegant cabriole legs and the lid is beautifully decorated with engine turning surrounding a central circular vacant cartouche. The hinged lid opens to reveal a deep chocolate brown lining having been recently re-lined creating a fresh and clean finish ready for use. The silver is fully hallmarked for Birmingham 1925 together with the makers initials for Charles S Green & Co. Excellent condition, measuring 6 5/8" x 3 1/4" x 2 1/4" tall. Item ID: 36833. By J.B. Chatterley & Sons Ltd.
J.B. Chatterley & Sons Ltd.